Inspired yet again by Stephanie Ackerman's 52 card pick up online workshop I did last year I am applying some of the techniques I learnt in a different way. Tim's fabulous paper stacks have several different size papers in them and all the smaller ones tend to get left as the larger ones get used up, so I am on a mission to use up some of these gorgeous pieces - we might even start a new trend with 3x4's becoming the new ATC's or twinchies for 2015. Here are the steps I used on my first four and of course I am using the gorgeous Wallflower stash. Adhere paper to strong card with glue n seal, coating the top of the patterned paper as well. Smear some white acrylic paint in random places. Use Tim’s small talk stickers to add a quote. Add some remnant rubs and small dark die-cuts. 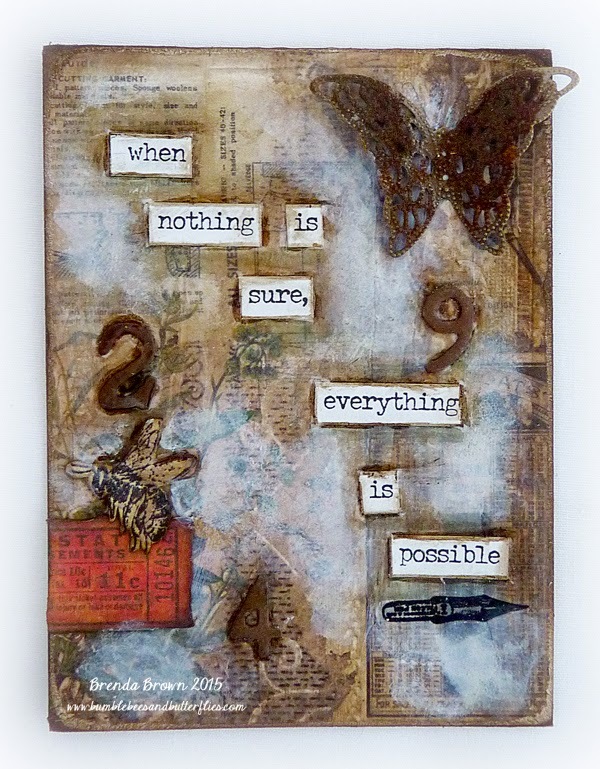 Smear some glue n seal over the pieces you've just added and dry, then with a dark colour distress marker, (I use walnut stain, gathered twigs or black soot), create shadows and depth around the quote and small die cuts. Sand the edges of each 3x4 and ink with walnut stain DI. Use cut outs and embellishments that go with the theme. Once it was all put together I went over with the white acrylic and distress marker again to finish off edges etc. Thanks for stopping by today and I hope I have given you some ideas as to how to use up those small papers that we often have left over. Adding a layer of white paint really adds a wonderful look, i use a small brayer to apply mine as it gives great texture. I love making ATCs, not made a twinchie but i do use index card size which are 3 x 5 inches and really enjoy what you can do with them. 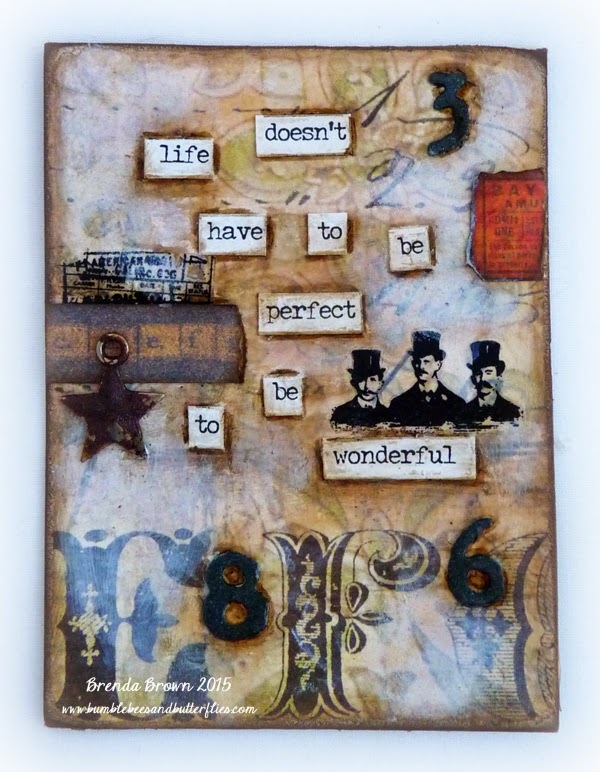 These cards are fantastic mixed media creations, Brenda! 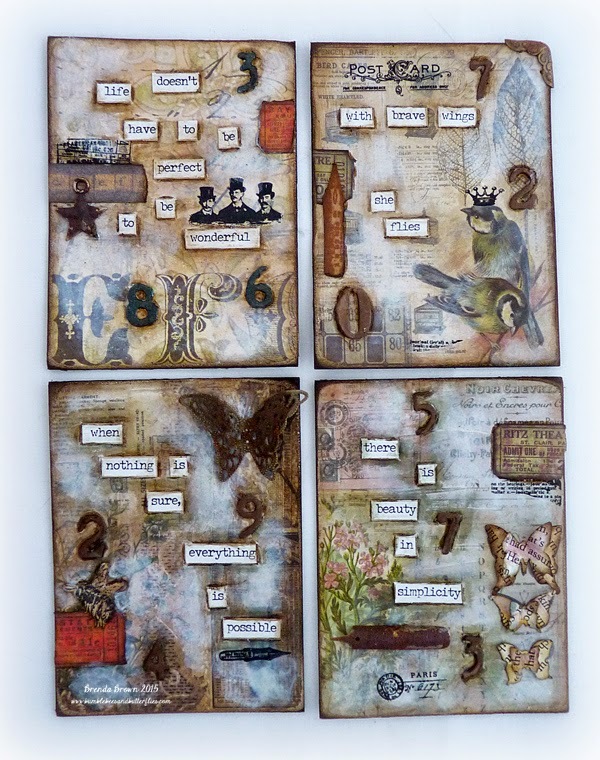 I love the rust elements here and my favorite Tim's Wallflower paper collection! A perfect touch of white paint! Awesome! Love this set of four! Full of interested. A wonderful collection of cards, I love them all - such a lot to look at. Love all these fantastic pieces, great details and word quotes. Oh my gosh, Brenda! These are beautiful! I love the small size. Thank so much for stopping by my blog. Love what you have done here Brenda and will try to remember this. I have this paper pad and have been wondering how to use it , so thank you, when I get the bits I will know what to do. Brenda, I love how you used those papers! Each one is a work of art and I love the steps you shared. I so need to find just time to have a fun play!!! Happy Weekend! Hugs! What a super idea Brenda. Thanks for the inspiration. I love 3x4 size...excellent idea! These are wonderful! What wonderful little works of art! I love all those details you were able to incorporate into such a tiny space! You have really inspired me to get moving on some of these little cards! I have to find another one of those segmented panels like I made for the 12 Tags of 2014 project! Thank you for all your really supportive comments on my blog. Hugs! 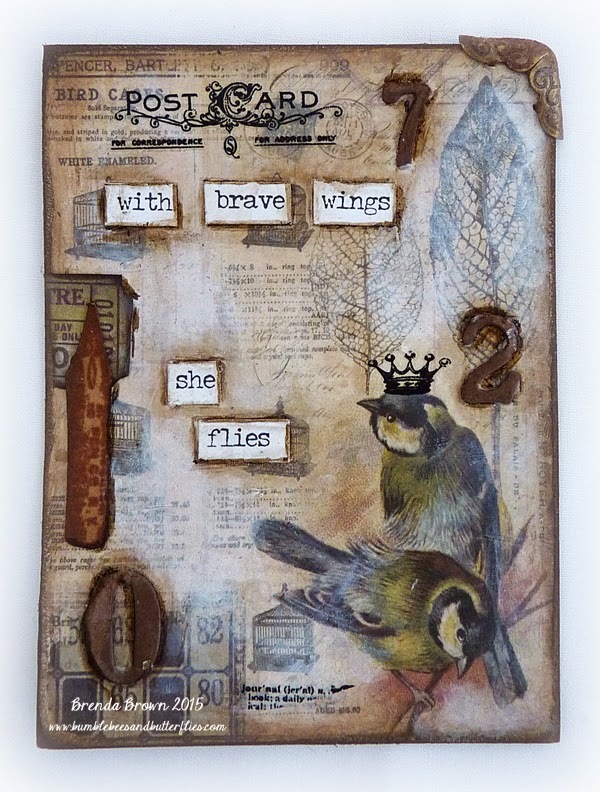 Lovely little artworks, Brenda - looks such fun to play with those papers and add all those fab bits and bobs! 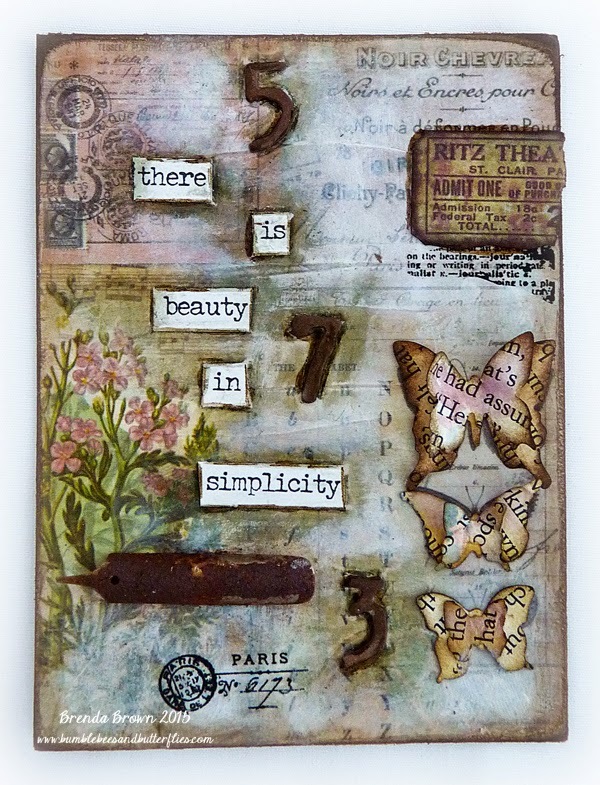 Beautiful Brenda, what a wonderful way to use those gorgeous TH papers! (and I think you're onto a great idea, 3 x 4's for 2015!). Great way to use up those papers, love your cards! !